You can see the piano very far away! 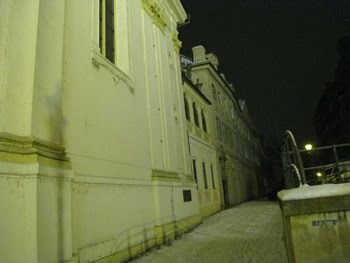 Rehearsal was just 2 hours before the concert so when we arrived there, it was already very dark outside. When Honoka and I were looking for the entrance, clever Arisa quickly took these photos. Can you feel the quietness of this street covered with the snow? Outside of the church, very quiet. Inside the church, we again climbed many steps to the greenroom. Programme for tonight is Shostakovich No.1, Takemitsu Between tides and Beethoven “Archduke”. 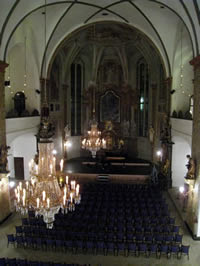 Pipe Organ. We have been walking along this balcony. Honoka found out later in the internet(!) 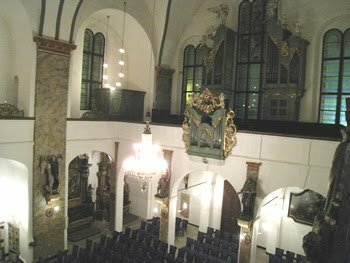 that Haydn and Mozart have played the pipe organ in this church!! We have been walking many times along the organ to get to the platform, so if we were very lucky, we might have walked on the same floor!! Our first summer concert in July was at Uckfield Music Club. This was our second visit to this concert club and it was so wonderful to meet the people we remembered again!! It is only about one hour away from London Bridge Station but as soon as we arrived at Buxted station, we felt so relaxed with lovely flowers by the rail station welcoming passengers off the train. 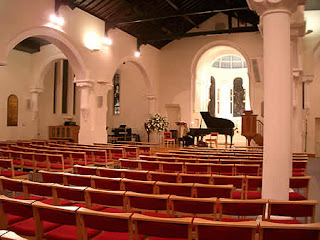 We played in the beautiful St. Margarets Church. The room we had to ourselves was the place where the church bells are rang. When we looked up into the ceiling, we could see many ropes hanging through the holes of the ceiling as though we were looking at the chandelier made from colourful ropes!! Next day, we took a train back to London from Buxted Station. 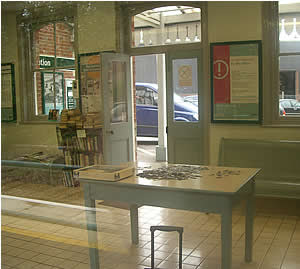 At the entrance of the station where the ticket office are, there was a table in the middle of the entrance hall with 1000 piece jigsaw puzzle, a small bookshelf full of books, and even a small red table and chair with toys!!! It was really a lovely trip!!! Last night, we were playing at “Dart Music Festival”!! This exciting music festival is celebrating its 10th year this season and we were very honoured to be able to take part!! We played at the St. Saviour’s Church in Dartmouth, which is a beautiful church with enormous pillars. When we arrived at the harbour in the town, we saw a lot of sailing boats resting with a very large cruise ship under the blue sky and many people strolling ashore under the sun. Just like in a tropical island having a wonderful time! When we went into the church to rehearse, there was a couple who asked us if we are playing tonight. They told us that they are touring England with this cruise ship we saw in the harbour!!!!! After the concert, the town was full of people enjoying the holiday and festive atmosphere with music coming out from all corners of the village!! 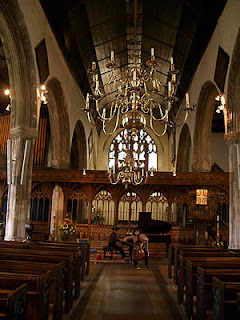 Last month, we played at the Holy Trinity Church in Claygate Surrey. This beautiful church is said to have built in 1840 with a spacious hall extension, which can be used for many different occasions. 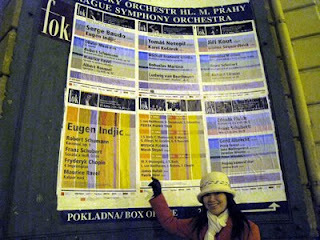 After the concert, it was so wonderful to see the people we know and also making new acquaintances! We met a lady from Japan who has her own blog site introducing many lovely sights of Surrey. She kindly took our photograph after the concert. Next day we found our photo in her blog page. We were very excited!! Only thing I regret was I have forgotten to ask the name of this lady. Dear Mrs “surrey_breeze”, Thank you very much for coming to our concert!! I have been making many New Year resolutions this year and one of it is to write my 1001 Night short essays twice a month starting from today!! If I am very good, hopefully to write few more times..!!! 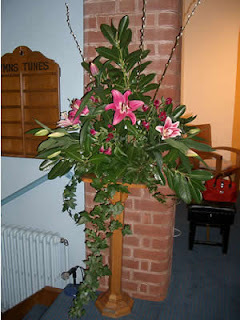 Yesterday, we had our first concert of 2007 at Droitwich Spa Methodist Church. We have been there about 2 years ago and it was so wonderful to see the people we knew from before again!! It is amazing how you can remember the way you have placed the piano on this particular platform or how we had our delicious supper at the nice and cozy foyer! It comes back in your mind so vividly that it seems time has never moved an inch since 2 years ago!! This is the photograph of absolutely beautiful arrangement of flowers. I tried to take a photograph but I am afraid this does not do the justice, as it was very beautiful with lilies and slender branches with silver buds. We really enjoyed having lovely supper afterwards with smoked salmon!!! Luxurious start of 2007! !